Bering Land Bridge National Park. During the glacial epoch the Bering Land Bridge was part of a migration route for people, animals, and plants whenever ocean levels fell enough to expose the land bridge. Archeologists agree that it was across this Bering Land Bridge, also called Beringia, that humans first passed from Asia to populate the Americas. The Preserve's western boundary lies 42 miles from the Bering Strait and the fishing boundary between the United States and Russia. The distance across the Bering Strait from Siberia to Alaska's Seward Peninsula is approximately 55 miles, and for several periods during the Pleistocene Ice Ages the trip could be made entirely on land instead of water. During additional periods, the passage from Siberia to North America could also have been made by small watercraft moving along coastlines. 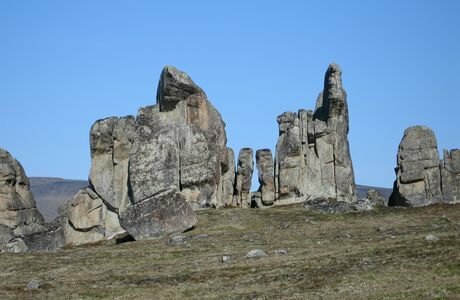 Bering Land Bridge National Preserve commemorates this prehistoric peopling of the Americas from Asia some 13,000 or more years ago.